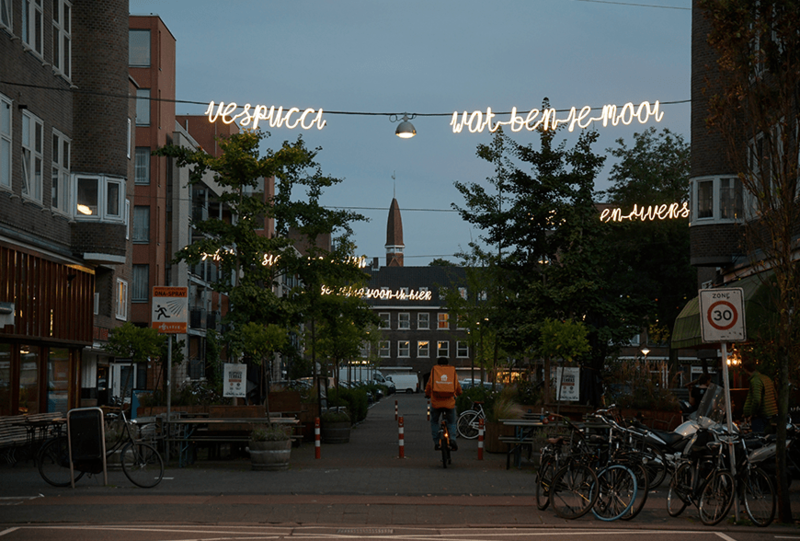 Vespucci you are beautiful 'is a light artwork of sentences that light up above the street. The words are made up by the neighborhood and provide multiple ways to connection houses and residents. 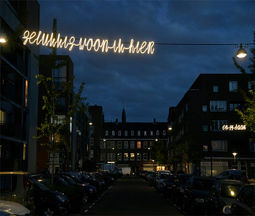 The light artwork, which hangs on 7 cables above the Vespucci street, was designed by the Amsterdam designer Frederike Top on behalf of Stadsdeel West. District Midwest played a supporting role in neighborhood participation. In this project the neighborhood plays the main role and it concerns both the people who live there and those who visit the neighborhood (social design). 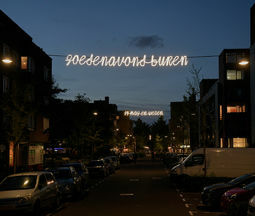 The different sentences that hang above the street are all custom made designed and created by the good cooperation between Frederik and the light engineer from InventDesign. In the Vespucci street you can read sentences like 'you may be there', 'I live happily here', 'and you there' and 'Vespucci what are you beautiful'. Because of these special phrases, wishes and messages that have been devised by the neighborhood, visitors and residents of the street are given something. A positive feeling, something to think about or just a nice rule. The phrases are composed by connecting handwritten LED letters to each other. They are then attached to an existing cable above the street. Use was made of the current points to be as sustainable as possible. Prior to the project, postcards were distributed on which the residents could write a sentence as an entry for the project. Or to send to someone yourself. At T's, Koeckebackers and Bar Baarsch there were return boxes to collect everything. During a neighborhood brainstorming session at Midwest, most ideas came up and a selection of the best street sentences was made by those present. These are now visible in the street and connect one house with the other. In addition to a function, the lighting now also contains content and shows the identity of the neighborhood. Over time, new sentences and words can be formed with the existing letters, as a name chain the letters can be exchanged and a new street scene is created.